The New Hampshire Board of Nursing (BON) is responsible for the entire Licensed Nursing Assistant (LNA) process, beginning with approving program curriculum to maintaining the New Hampshire Nursing Assistant Registry. New Hampshire is one of the few states requiring mandatory licensing of nursing assistants. The LNA is the equivalent of the Certified Nursing Assistant (CNA) in other states. The LNA can add certification as a Medication Nursing Assistant (MNA) by completing a state-approved Medication Administration Program and meeting all other eligibility criteria. The following sections give an overview of the process for becoming a Licensed Nursing Assistant in New Hampshire. It is important to carefully follow the state requirements to become a LNA in New Hampshire. Many people choose to become a LNA in order to gain employment opportunities in healthcare in a short period of time. After some experience, they can use their LNA training and experience to pursue a degree in nursing. Following is a summary of the steps to becoming a LNA in the state. There are multiple routes to earn LNA certification in New Hampshire. Certification requirements vary depending on the person’s status. Individuals will complete a state-approved LNA Education Program and take a competency evaluation exam in New Hampshire. Under certain circumstances, some individuals can challenge program completion and/or testing in New Hampshire. Typical individuals who request licensure by comparable education include nursing students, graduate nurses, Registered Nurses (RNs), Licensed Practical Nurses (LPNs) and military-trained personnel. The New Hampshire Board of Nursing determines who must complete a Challenge Program. With the appropriate documentation of the successful completion of a Challenge Program, the individual can apply to the New Hampshire Board of Nursing for nurse aide licensing and placement on the New Hampshire Nursing Assistant Registry. A foreign-trained nurse can also apply to become a LNA in New Hampshire. The RN degree should have been earned within the five years prior to application. The New Hampshire BON will evaluate the courses to determine if they are equivalent to LNA training courses. The individual must also have worked as a nurse within the last five years. If it is necessary to complete Licensed Nursing Assistant training, students will find there are several locations for LNA training programs. Training can be completed through the American Red Cross and New Hampshire Job Corps, and at technical schools, nursing facilities and community colleges. Each program sets its own tuition and fees rates, course length and required hours. These features can differ among programs. Find the best state-approved LNA classes in New Hampshire. 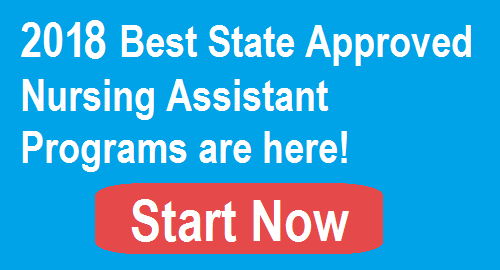 We’ve listed the top nursing assistant programs in New Hampshire to help you prepare for the Licensed Nursing Assistant certification exams in the state. The program list is updated in November, 2017. The American Red Cross Nursing Assistant Training Programs are held in a variety of New Hampshire cities, so there is a program easily accessible by most state residents. The Red Cross program is 9-weeks long and requires 150 hours of classroom and clinical training. It costs $1,400 for the course, CPR and AED training (Automated External Defibrillator), and textbook. Students will also have to purchase uniforms and some supplies. There is financial aid available for qualified individuals. For comparison purposes, the Lakes Region Community College Licensed Nursing Assistant Program consists of 106 hours of classroom and clinical training. The course fee is $1,362 and includes tuition, student fees and a drug testing fee. Students also have to purchase or rent a textbook, buy a uniform, and pay health and background check fees. Though the course is not eligible for financial aid, the school can direct students to possible funding sources, including Workforce Investment funds. There are several ways to get free training. The Job Corps in Manchester, MH offers an 8-12 month nursing assistant training program. The program is open to 16-24 year old individuals and requires living on campus because students also learn life skills. The program is free to those admitted. Federal law requires employers in Medicare/Medicaid funded facilities to pay for the cost of training if the student is also employed. This is another way to get free LNA training in New Hampshire. However, the student can only work for up to 120 days without licensing. If a person is hired by a nursing facility within 12 months of completing training, the Medicare/Medicaid employer is required to reimburse prorated training costs. New Hampshire has also implemented a state reimbursement program. LNAs employed by a New Hampshire DHHS licensed facility within 12 months of completing training can request reimbursement for the costs of training and training by submitting an application to the Bureau of Elderly & Adult Services (a division of the NH Department of Health and Human Services or DHHS). Licensed Nursing Assistant training programs are allowed to establish prerequisites that exceed the minimum. For example, the LNA program may require a minimum age of 18 years old and a high school diploma or GED. It is important to review specific school and training program requirements before attempting to enroll. Activities of daily living – hygiene, grooming, nutrition, rest and sleep, etc. Basic nursing skills – infection control, safety, emergency procedures, therapeutic procedures, data collection and reporting, etc. Restorative skills – self-care, maintaining independence, etc. LNA courses prepare students to fulfill typical job responsibilities and to deliver high quality and ethical services. Individuals get three attempts within 24 months to pass both parts of the competency evaluation. Anyone who fails either or both parts of the test within the three attempts will have to retrain and retest. After successfully completing LNA training and passing the competency evaluation test in New Hampshire, the person’s name is place on the Registry. The state recommends that all LNAs personally check the Registry to ensure they are listed correctly. The Medication Nursing Assistant can administer medications to stable clients under the supervision of a Registered Nurse (RN) or (LPN). To renew LNA certification (licensing), the Licensed Nursing Assistant needs to complete a minimum of 24 hours of continuing courses during the certification period (12 hours per year). A renewal application is sent to the New Hampshire Board of Nursing. The form includes employer verification of the hours worked. If the LNA is medication certified, at least 8 hours of the 24 hours (4 hours per year) must be in medication administration. To keep the license active, a nurse aide must also have worked at least 200 hours as a nurse aide during the certification period. The LNA who is also a MNA must work a minimum of 50 hours as a medication nursing assistant during the certification period. A lapsed nursing assistant license can be reinstated by completing the 24 hours of continuing education courses, and retesting and passing the LNA competency exam.